Written by IUCN’s Global Gender Adviser, Lorena Aguilar. Also posted in the Huffington Post. On November 19, I was the keynote speaker at a gender conference for staff of Mexico’s National Forestry Commission (CONAFOR), presenting The importance of mainstreaming a gender perspective in the forest sector. Part of the reason I was so excited to be doing this in Mexico is because Mexico has become a leading force in mainstreaming gender. They recently published a National Development Plan (2013-2018), which established the inclusion of a gender perspective as a cross-cutting principle that must permeate Mexico’s legal framework, policies, and programs, in all areas and at every level. This is great news! Research shows there is a strong correlation between climate change mitigation, forests and women’s participation. Forests are the greatest carbon sinks for land ecosystems; however, one of the largest sources of carbon emissions comes from human-induced deforestation, which is rapidly diminishing these sinks. The use and management of forests by people depends on their economic, social, cultural, age and gender contexts; women and men use and depend on forests differently given their gender roles and responsibilities. Environmental challenges are too huge for just part of the population to participate—these challenges need to be tackled by both men and women so that the whole community has the tools and knowledge to protect and develop their forests. Mexico is a frontrunner in integrating gender considerations into policy and planning—most recently turning an international commitment into policies and laws. 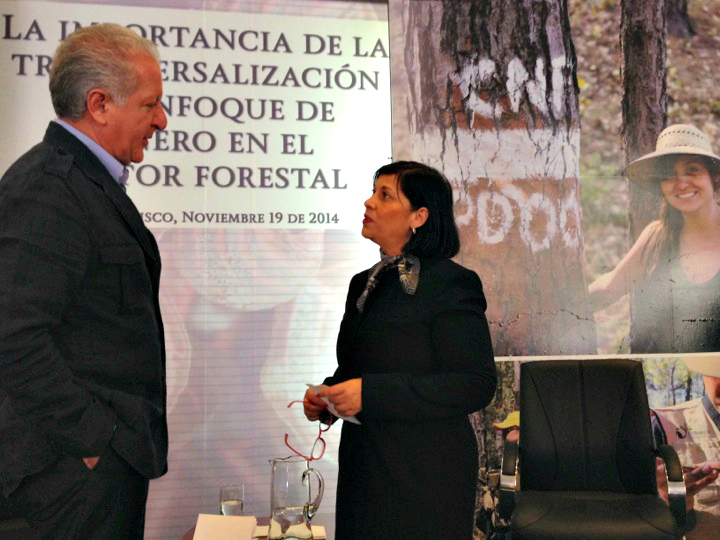 This commitment has permeated communities that live in forests, many members of which are women. It is important to recognize that both women and men who live in forests are important actors in conservation initiatives, which is why it is crucial to promote actions that reduce inequality and gender gaps. Without formal land titles, women cannot access programs for equipment, infrastructure, credits, or economic benefits, such as payments for environmental services . In Mexico, 19.8% of the 4.2 million ejidatarios (land owners) are women. At the upcoming United Nations Framework Convention on Climate Change (UNFCCC) Conference of the Parties (COP) in Peru, gender will be the focus of an entire day—December 9—evidence that gender considerations and the importance of women in combating climate change is gaining greater and greater recognition. There is still room for improvement, but we are excited to see the progress that has already been achieved. We’re so excited in fact, that we’ve decided to celebrate Gender Day by hosting a cocktail reception, along with the Government of Peru and other key partners, to both recognize the advancements of gender equality in the UNFCCC so far, and inspire continued concrete action.